The region's key decision makers to gather for the fifth Arabnet Digital Summit on May 16-17 at the Madinat Jumeirah Conference and Events Center in Dubai! Dubai - The region’s key decision makers will gather for the fifth edition of the ArabNet Digital Summit - the region’s most influential conference for digital business and innovation - on May 16-17, at the Madinat Jumeirah Conference and Events Center in Dubai. For the first time this year, the Summit is spread across 4 separate Forums: AdTech, Smart Economy, Digital Commerce, and Innovation & Investment and will bring together 80 speakers, 50 exhibitors, 1200+ attendees, over 50 international and regional investors, as well as 35+ key talks and sessions. The AdTech Forum on May 16 will feature two full tracks covering the latest trends in digital media and advertising, including the AdTech Showcase - a convergence of new advertising and media technologies from around the world to improve the impact and efficiency of campaigns, and help publishers maximize revenues. Speakers include some of the best in the sector such as Scott Lamb, Vice President of International at BuzzFeed; Lauren Maillian, serial entrepreneur and best-selling author; Tim Wolfs, Chief Digital Officer at Altavia Group; as well as John Stoneman, General Manager - Europe at Triplelift. On the same day, the Digital Commerce Forum will explore the emerging trends and opportunities in e-commerce, e-retail and payments in MENA, as well as the digital transformations taking place in the banking sector, and the fintech innovations changing the financial services industry. Experts include Faisal Khan, Banking & Payments Consultant and FinTech Scout for VCs/PE; Alpesh Doshi, Founder and CEO at Fintricity; Matthew Gardiner, Founder at Catch London; Rasool Hujair, CEO at Najm; and Ronit Ghose, Managing Director - Global Banks Sector Head at Citi Research. On May 17, the Innovation & Investment Forum will feature a full track for investors, with high-level discussions that include LPs, private equity investors and family offices. It will also feature a full track where the most successful startups will share their experience highlighting cross border growth, raising capital, acquisition, and building teams. Investors/innovator speakers include Nabil Borhanu, President and Managing Member at Graphene Ventures; Chris Adelsbach, Managing Director at Techstars; Jeff Lynn, CEO at Seedrs; Luke Krueger, President at VA Angels International; and Ovais Naqvi, Managing Director at Abraaj Group. Finally, the Summit will feature the ArabNet Startup Championship, powered by PepsiCo, with pitches from 18 of the most promising startups from across MENA, hand-picked through local pitching rounds. Simultaneously, the Smart Economy Forum will cover smart cities, smart governments, the future of cars and transportation, and the digital enterprise - as well as the blockchain and machine learning technologies that are driving this transformation. Global experts who will be speaking include Simon Sylvester-Chaudhuri, Managing Director at Smart Cities NYC; Tim Lea, CEO at Veredictum.io; Ussal Sahbaz, Innovation Leader - Turkey at GE; and Todd OBrien, Managing Director at Startup Bootcamp. The Digital Summit will also be hosting for the second consecutive year, the Smartpreneur Competition final pitches and awards ceremony, organized by Dubai Chamber of Commerce in cooperation with the Smart Dubai Office, to support the transformation of Dubai into a “Smart City”. ArabNet is a leading events, media and research company focused on digital business and entrepreneurship in MENA. ArabNet organizes major annual conferences in Beirut, Riyadh, Dubai, and Kuwait; publishes news and analysis of the digital sector on its online news portal and print 'ArabNet Quarterly' magazine; and creates original research reports about the region’s digital industry. 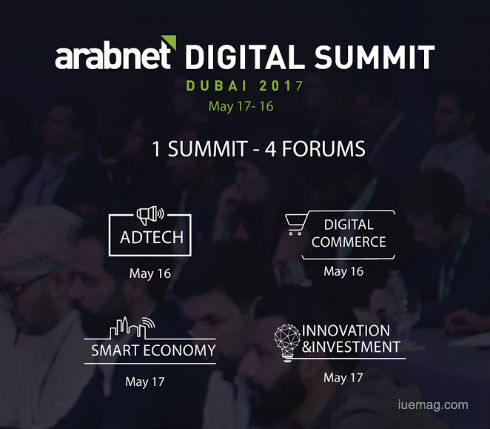 The iUeMagazine team is delighted to work with ArabNet Digital Summit 2017 as Online Media Partners & is expected to bring Unlimited Inspiration for all readers from the proceedings of this event. Staying tuned to the enriching updates from this event is recommended. Any facts, figures or references stated here are made by the author & don't reflect the endorsement of iU at all times unless otherwise drafted by official staff at iU. This article was first published here on 4th May 2017.